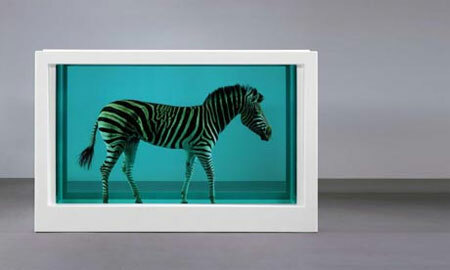 Check out Damien Hirst's work. I have just the spot for either the zebra or the golden calf. Now Todd darling be practical, what would you do with a zebra in a San Francisco apartment why the smell alone will send you round the bend. What the HELL? I was just sort of weirded out until I got to the hairless praying sheep. HAIRLESS PRAYING SHEEEEEEP!